Hey guys! 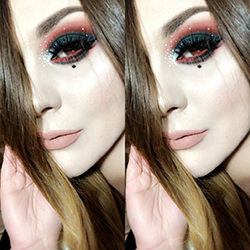 This is going to be a super short post, but I really want to share this look with you guys. I was messing around with my beloved BH Cosmetics palette the other day and I whipped up this colorful and bright look. Isn't it fun? And who doesn't love rainbows, right? Wow!!! How in the world did you manage to do this! It's sooo freakin awesome! I love love lovvvveeee it!!!! ooh this is so damn cute!! not to mention nicely done, love it girl! This is so well done!! I love it. You are so good at blending, I'm jealous. I'm going to have to try this. Thanks for the photos. Simply amazing! You did a beautiful job on this raimbow liner! O.M.G. *dies* it's like a technicolor gif on your eyes! i love it! you do the most creative and beautiful looks, I swear! WOOO! I need to buy fix spray because you've totally inspired me to start using shadows as liner. I've done it twice this week alone! I literally went, Oh my god. I'm going to attempt to pull this off as well as accomplish this as soon as I get some more eyeshadow! I'm going nuts over this! It looks absolutely amazing! AHHHHHHHH, can't get over how fab this is! This looks fantastic! I would love to know how you did it. Holy crap, I LOVE this!! WOW! So so so so awesome! this is so awesome!!! you just made the perfect way to wear colorful e/s everyday b/c its so wearable (= love! Absolutely brilliant...what is fix spray though? Amazing! Honestly I can only say that it is incredible. Un besiño. ALways so inspiring!! I love it! :O Can't add enough compliments to what's been said already. Just amazing :D the ideas you come up with wow! I must get this palette asap! GASP!! Its amazing!! So precise and perfect!! Love it Ronnie!! This is so pretty! I love the way it hugs your upper lash line and wings out like that. Very unique and perfectly done! I can't believe how beautiful this make up is. Amazing all the way. You have some serious talent and skill! I just found your blog and I'm seriously blown away by your talent, you are absolutely amazing. I'm really inspired to try a few of your looks out! AH! I LOOOOOOOVE that! Can you put up a few notes on how you managed it?? SO gorgeous. Double rainbow all the way across your eyyyyeeeessssss! P.S. I hate you. I wish I'd done this first. P.P.S. I don't hate you, I love you, I'm just a little jealous, and drunk. Your looks are always soo amazing.. This is sooo cute, I love it!!! This is the coolest look ever!!!!!!! Love it!!!! There are no words, this is just the coolest thing I've seen in ages. I tried to re-create this look yesterday. It's not nearly as good as yours, but I think I succeeded. =) Thanks for the inspiration! I tried this tonight and I LOVE it! I used a bit more glitter on my bottom lashes though. Definitely going to rock this next time I go to a club :) Thank you! Simply amazing ... eyes are looking so beautiful by the help of radiant rainbow liner.. this type of liner is move on now a days... this type of liner is in fashion now..
Good thing I did a reverse Google Image search & found the source. People cropped your watermark. SMH. This is super cute and fun! I never wear makeup but I may try this sometime. I love it! THANK YOU! I'm excited that my eyeball is on there, but I made sure to send them an email about it! Hey, Ronnie- I just tried a version of this look and put it up on my brand new blog- what do you think?